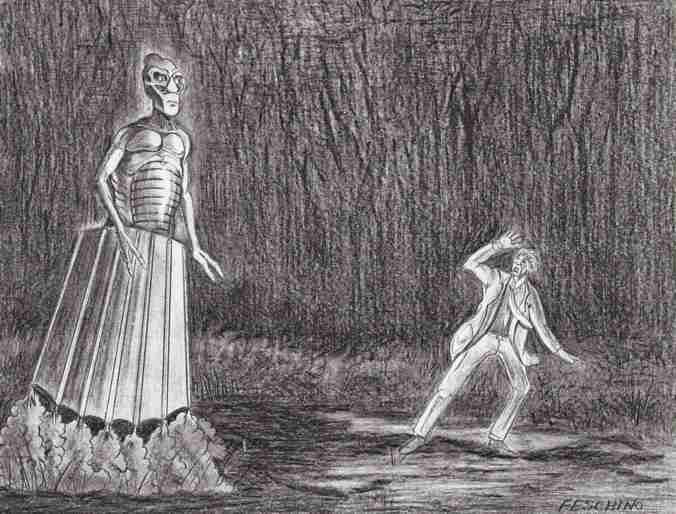 Shortly after the "Flatwoods Monster" and "Frametown Monster" crash occupant episodes occurred in Braxton County, WV on September 12th and 13th in 1952, another huge alien "Monster" was reportedly sighted in another region of West Virginia that terrified some local witnesses. That day shrouded in mystery was Monday, September 15, 1952. This incident occurred in the northern panhandle of the state near Wheeling in the Vineyard Hills Housing Development, an area approximately five miles from Oglebay Park, a huge sprawling 1,650-acre public resort. Flashback three days earlier to the September 12, 1952 UFO flap. Three mid-Atlantic damaged UFOs proceeded west and went down in the United States. They were; 1) Arcadia, Tennessee 2) Wheeling, West Virginia and 3) Flatwoods, West Virginia. Here, reader, was the second damaged UFO that went down in the Oglebay Park area near Wheeling that involving an occupant later sighted by the locals in Vineyard Hills. This crash occupant episode wasn't nearly as well-known as the two previous Braxton County close encounters - but this so-called "Monster" incident also reflects the incidence of being quickly covered up by officials. In this case it was local officials, more specifically, the Wheeling Police Department. The opening of this article stated, "Bashful Billy," the monster from outer space and southern West Virginia, arrived in Wheeling by flying saucer yesterday and promptly set tongues wagging and telephones burning." Here, reader, take note of the reflex ridicule in this statement. Curiously, the article also stated, "One call to the Intelligencer office asked if it was true that the horribly burned body of a woman was found at Vineyard Hills and that a policeman was burned mysteriously about the arm." What?! Now, reader, especially those who are familiar with the Braxton County incidents, read this additional reportage, "Callers also reported that an unpleasant odor was produced by the monster." Notice reader, the familiar bells decidedly rung between this incident and the previous two close encounters at the aforementioned Flatwoods and Frametown involving "monsters." An officer from the Wheeling Police Department was interviewed about the incident, "Lieutenant Murphy said undoubtedly the rumors were caused by over-active imagination following yesterday's Intelligencer story of an outer-world monster, reportedly spotted in the woods near Sutton, W.Va."
This article also reported, "The Wheeling monster must have been a 'Bashful Billy,' however, as, none of the people who called the Intelligence or police had actually seen the fugitive from fairyland, but were merely passing on reports from people who had talked to people who heard about the Vineyard Hill Frankenstein." Once again reader, the witness "over-active imagination" factor came into play here as it did in the "Flatwoods Monster" case; in 1953, Albert Chop, public liasion for the USAF told Major Donald Keyhoe the following about the witnesses involved in the "Flatwoods Monster" encounter: "The group did see two glowing eyes, probably those of a large owl perched on a limb. Underbrush below may have given the impression of a giant figure. IN THEIR EXCITEMENT THEY IMAGINED THE REST." I ask, did the Wheeling Police Department contact the government about this "monster" incident and get briefed as to how to handle this situation? The article reported that, "Bashful Billy" was a "10-foot tall monster from another world" and was said to be "gas-breathing." Once again reader, notice similar bells rung between this incident and the Flatwoods and Frametown cases involving "monsters." Here, the referenced "gas breathing" statement was actually the exhaust of the propulsion system, which was part of the lower system of the hovercraft. It seems these devices carried and propelled these aliens... it was their mode of transportation. Additionally, this seems to have been the same gas that caused an, "unpleasant odor" as noted by the other previous witnesses, Mrs. May, the boys and then George Snitowsky! Now reader, was the "body of a horribly burned woman" really found by the Vineyard Hills locals on that Monday? At this time, there seems to be no evidence of any such horrific incident or accident during that time in the Wheeling area. But read between the lines here, reader, because there is usually some sort of truth contained within the context of a complex cover story. Was the "Bashful Billy" monster incident just a rumor caused by over-imaginative people who had read about the Flatwoods case? On the other hand, was this the cover story to hide the truth of a horribly burned alien body found there after being dropped off from a damaged UFO in Oglebay Park three days earlier during the September 12 flap? Curious and more curious, still, reader. I ask, did a Wheeling Police officer actually respond to the scene at Vineyard Hills and approach a dead or dying extraterrestrial being and get burned upon making contact with it. Remember what happened to the hood of George Snitowsky's car! The Wheeling Intelligencer continued to follow this mysterious "Monster" story. On September 17, 1952, it reported two more sightings of another monster that was called a "roving monster." These sightings occurred on Tuesday, September 16, 1952 in nearby Ohio. One caller had contacted the Intelligencer and reported, "his grandchildren were 'almost scared to death' by something they had seen." Another Ohio caller reported, "It was 10-15 feet tall and had a green body and red head." More familiar bells reader! Was this "roving monster" actually another alien looking for the ostensibly stranded alien found dead already by the Wheeling locals the day before? What was happening "really," in the West Virginia area of Wheeling. Well reader, this is only the tip of the iceberg here and if you want to read all the accompanying articles regarding these UFO incidents, and other documented incidents involving the September 12, 1952 UFO flap...read on, in Frank Feschino's groundbreaking book, "The Braxton County Monster-UPDATED AND REVISED EDITION-The Cover-up of the Flatwoods Monster Revealed." Oh and yes reader, this is all, and very much, too real! Not Flatwoods! Frametown, eh? This is a whole other fish kettle and downed alien aviator incident, a result of the war declared upon them, perhaps. No smiles here. Snitowsky attempted to start the car but it failed to turn over after several attempts. George was getting frustrated. He jumped out of the car, inspected the engine and battery cables but found nothing wrong with the car, which puzzled him. Moments later, the fresh mountain air around them suddenly became engulfed with a noxious fog and terrible odor that Snitowski likened to a mixture of ether and burnt sulfur! He thought there must be a nearby business or factory that was on fire to justify this chemical stench, only that would account for the toxic fire odor spreading throughout the area around them. He could see no evidence of a fire! What the hell, he began to wonder. Snitowsky got back into his car and rolled all the windows up. It was quiet, then shockingly, a dazzling beam of deep purple light flashed across the hood of the car from the nearby woods! George rolled the window down to get a better look. The sickening odor of the strange fog entered the car. The interior filled with the cloudy haze surrounding it and they began to gag from the stench. The baby began to wail uncontrollably. The situation was getting worse by the second. As everyone gagged, heaving from the nasty odor, George got out of the car hell-bent on doing something... perhaps get some answers from the brilliant light in the woods. He walked gagging towards it and as he got closer he was dumbfounded, a dear in strange headlights, to clearly see a glowing UFO hovering behind some nearby trees! It was ovoid in shape and gently rocking back and forth. Without any warning, then the hovering being moved towards George. He said the alien figure seemed to glide across the surface of the road at him. 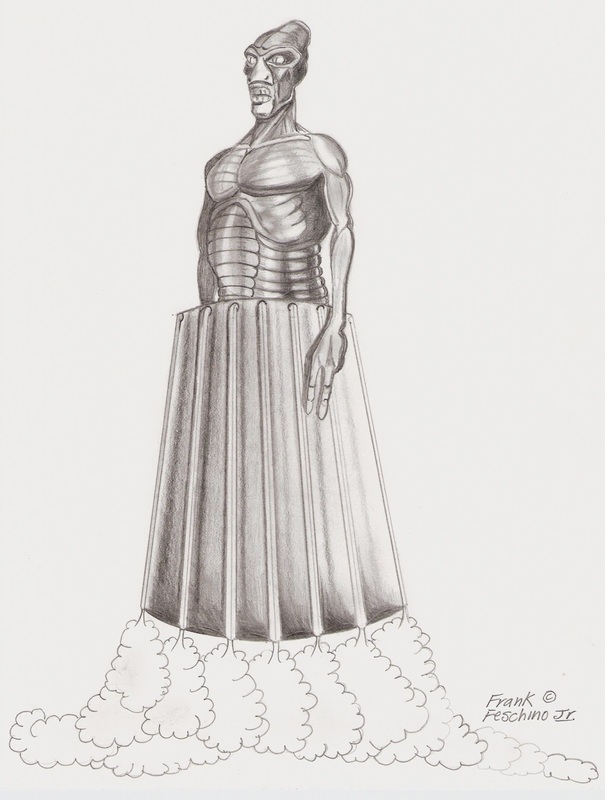 Snitowsky further described the lower torso of the being as a solid mass, a conveyance. A construct. A craft. The huge figure then circled their automobile and seemed to stalk them as it lingered in the vicinity of the car. Unbeknownst to the Snitowsky's, the huge alien had stopped and positioned itself in front of the car. When George, thinking perhaps all was clear, looked up across the dashboard, he saw the being gazing down upon him through the windshield like the aforementioned demon! Book Review by Frank Thayer, Ph.D.
"I bought your book and have now read it thoroughly with an admiration for your massive research. There is no doubt that you have produced the ultimate work on a most important incident in the history of flying saucers. It is unquestionable that the Flatwoods Monster has been reconstructed by you to an understanding beyond a reasonable doubt...Your work is unlikely to be surpassed." "Thank you for your work. You set a standard for investigation that most of us can only marvel at." AND KEEPING THE "FLATWOODS MONSTER" ALIVE.